AutoRunWizard.com - AutoRun Wizard FAQ - How can I autorun more than 5 autoruns? 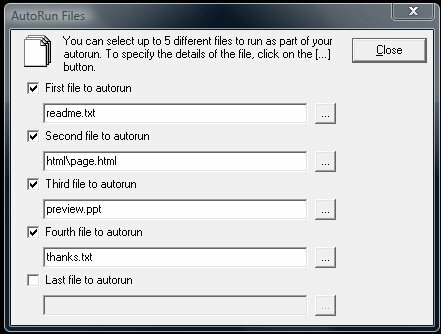 With AutoRun Wizard there is a hard limit of 5 autoruns per configuration. This means that you are restricted to autoruning 5 seperate applications when the CD-ROM is inserted into the computer. We have added this limit because we wanted to restrict the abuse of running files on client computer. First I would ask yourself, do you need to autorun more than 5 files? If so, then think about what you are doing. Can it be accomplished another way? For example, if you wanted to display 15 different art designs one right after the other --- is there a better way to present this information to the user? Yes there is. You can create an autorun menu from HTML that will dynamically link to your 15 art designs. What we are trying to help you understand is that there are many different ways to present your information to the end user, autoruning each of them is not always the best solution. Help us understand what your needs are. Email us and let us know why you would need more than 5 autoruns, explain to us so that we can understand. Please also consider an alternative way to presenting your information to the user on your CD.